Expedition On The Cheap? Did Organizers Recklessly, Negligently Put Lives And Property At Risk? Browse: Home / 2013 / December / 31 / Expedition On The Cheap? Did Organizers Recklessly, Negligently Put Lives And Property At Risk? With the MS Akademik Shokalskiy research vessel firmly embedded in ice and costs of the mammoth rescue effort mounting, the “scientific” Australasian Antarctic Expedition (AAE) led by Professor Chris Turney has morphed into a debacle that has put dozens of lives and property at risk. In under-estimating the world’s harshest environment and through slipshod planning and short cuts taken in a bid to keep costs down, expedition organizers may have recklessly and negligently put the lives of the 74 passengers in jeopardy. The purpose of the AAE expedition was to take a science team of 36 women and men south to discover just how much change has taken place at Mawson Station over 100 years. The expedition was also intended to replicate the original AAE led by explorer Sir Douglas Mawson a century ago, in 1913. The new expedition was to be led by Prof. Chris Turney, a publicity-hungry professor of climate change at Australia’s University of New South Wales. Also the expedition was designed to generate lots of publicity. Along the scientists and ship’s crew were 4 journalists from leading media outlets who would feed news regularly, and later report extensively on the results and findings. All this in turn would bring loads of attention to a region that is said to be threatened by global warming. The AAE’s donation website even states that the expedition’s purpose is to collect data and that the findings are “to reach the public and policy makers as soon as possible“. But expeditions of this type are expensive and funding is not always easy to come by. Costs can run in the millions as special equipment is needed to handle the extremely harsh conditions of the South Pole. Downplaying the conditions to justify cost-cutting by using lower grade equipment rapidly jeopardizes safety. The first error expedition leaders made was under-estimating the prevailing sea ice conditions at Mawson Station, their destination. The scientists seemed to be convinced that Antarctica was a warmer place today than it had been 100 years earlier, and thus perhaps they could expect less sea ice there. This in turn would allow them to charter a lighter, cheaper vessel. This seems to be the case judging by their choice of seafaring vessel. They chartered a Russian vessel MS Akademik Shokalskiy, an ice-strengthened ship built in Finland in 1982. According to Wikipedia the ship has two passenger decks, with dining rooms, a bar, a library, and a sauna, and accommodates 54 passengers and a crew of up to 30. Though it is ice-reinforced, it is not an ice-breaker. This is a rather surprising selection for an expedition to Antarctica, especially in view that the AAE website itself expected to travel through areas that even icebreakers at times are unable to penetrate, as we are now vividly witnessing. Perhaps the price for chartering the Russian vessel was too good to pass up. What made the expedition even more dubious is that Turney and his team brought on paying tourists in what appears to have been an attempt to help defray the expedition’s costs and to be a source of cheap labor. According to the AAE website, the expedition was costed at US$1.5 million, which included the charter of the Akademik Shokalskiy to access the remote locations. “The site berths on board are available for purchase.” Prices start at $8000! The expedition brought with it 4 journalists, 26 paying tourists. Here it seems that the obvious risks and hazards of bringing tourists to the world’s harshest environment in a budget-priced vessel unable to handle ice-breaking may have been brushed aside, or at least played down. Was this reckless on the part of the expedition? That Antarctica is a harsh environment was in fact known to expedition leader Chris Turney: Bild online here quotes Turney: “In the Antarctic the conditions are so extreme that you can never make forecasts.” Is this an environment you’d want to bring unfamiliar tourists in – on a vessel that cannot even break ice? As an expedition to Antarctica is nothing less than an extreme adventure in every sense, employing guides who are highly trained professionals would seem a must when tourists are involved. Scientists are not tour guides. Many of the passengers were there for the very first time and had zero experience with the region’s conditions. It seems reckless to me. The 5-week expedition started off relatively smoothly, but by Christmas Eve events turned for the worse and took the scientists by surprise. 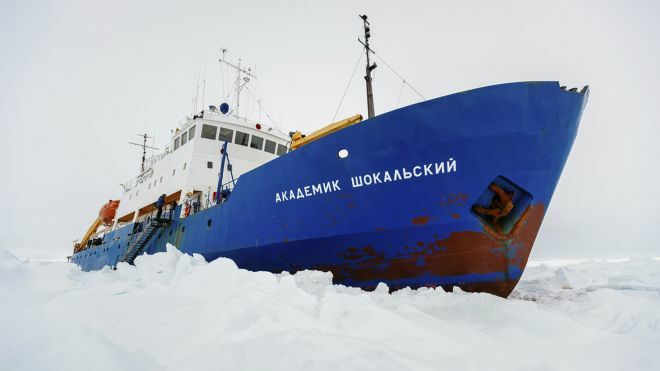 A thick layer of sea ice is claimed to have come out from nowhere and trapped the Akademik Shokalskiy after departure. At times it appeared Turney tried to deny the trouble he was in, even putting on a festive face. At times he pretended the weather was fine and that it was warm outside. Moreover, the media was on Turney’s side, and they actively provided a fog to hide the debacle from the public. Did he expect to find less ice than Mawson did 100 years earlier? This appears to be what he expected, given his expedition’s planning. Moreover it seems they lacked competent weather forecasting services. Why wasn’t it possible to see the massive sea ice coming? In the harshest environment on the planet one would think expert local weather forecasting is absolutely essential. There was no one on board who could give weather and sea ice forecasts? By December 30, having been stuck in 3-meter thick sea ice for almost a week, Turney seemed to be coming to terms with the dire reality and that his expedition had seriously underestimated the conditions, putting his team and the tourists in jeopardy. Later on, rather than blaming shoddy planning, Turney blames iceberg calving from the continent colliding with the extended tongue of the Mertz Glacier for changing the sea ice conditions in the region. That sort of thing normally happens to those who neglect monitoring weather forecasts, sea ice charts and real conditions. They can predict the climate for the year 2100 but not tomorrow’s wind and sea ice motion? And when the Australian icebreaker gave up trying to reach the research vessel because of a snowstorm, he called the storm “shocking” – as if it were something he had never experienced. Clearly Turney likes having it both ways: On one hand, depending on the occasion, things are warming and comfy in Antarctica and so it’s no problem bringing tourists along on joy ride in a regular ship, but on the other hand, when things go wrong, it’s always because of “extreme, unpredictable conditions” and so it isn’t his fault. When operating in the world’s most hazardous regions, there’s no excuse for not working doubly diligently. Clearly Turney’s expedition completely underestimated the task at hand and he now finds himself in it way over his head. Though he tries to put on a festive face, his troubles in fact may be only beginning. My guess is that he’s going to have lots of explaining to do and with lots of tough questions coming from some really tough people. We’re talking about having put the lives of dozens of people’s and property at risk – never mind the tab for the international rescue efforts with heavy equipment. Was it a good idea to travel in ship in a region that clearly even icebreakers are at times unable to navigate? Can scientists be expected to babysit tourists and half-witted journalists while doing their work? Why was there no competent weather forecasting? Can you blame the unexpected for every thing that goes wrong? Was the focus too much on publicity, and not enough on safety? In private industry the CEO responsible for such a costly debacle would be in tons of hot water by now. The fine print in the contracts now becomes important: Who was responsible for what? There are some big bills to pay. Turney and the expedition would be well-advised to find competent legal counsel very quickly. His websites and entries are rich in excuses, denials and admissions. There are going to be lots of big bills to settle. More importantly, hopefully fundamental measures will be implemented in the future so that such similar life-threatening fiascos don’t happen again. Sweeping the matter under the rug and attempting to laugh it off is an invitation for the next debacle. If Turney-like expeditions are allowed to continue, the Antarctic will soon turn into a junkyard of sunken ships and toxic waste.